When I visualized that I would be traveling Asian countries, I thought I would basically be doing temple runs. It certainly has the romantic arc about it. This is before I actually realized that temples could be quite crowded and surrounded by the market places. It can be quite a challenge finding temples, but there is a certain fascination about them. 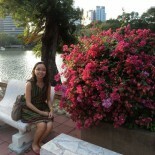 Found this while wandering around trying to find an MRT stop. There is supposed to be a Xintian Temple stop in the yellow line of the Taipei MRT. The facade really was grand. You can certainly feel how small you are and how strange everything actually is. The designs and colors are so complex, I have not made full sense of it yet, even after all this time. I felt in between noisy madness and silent grandeur. 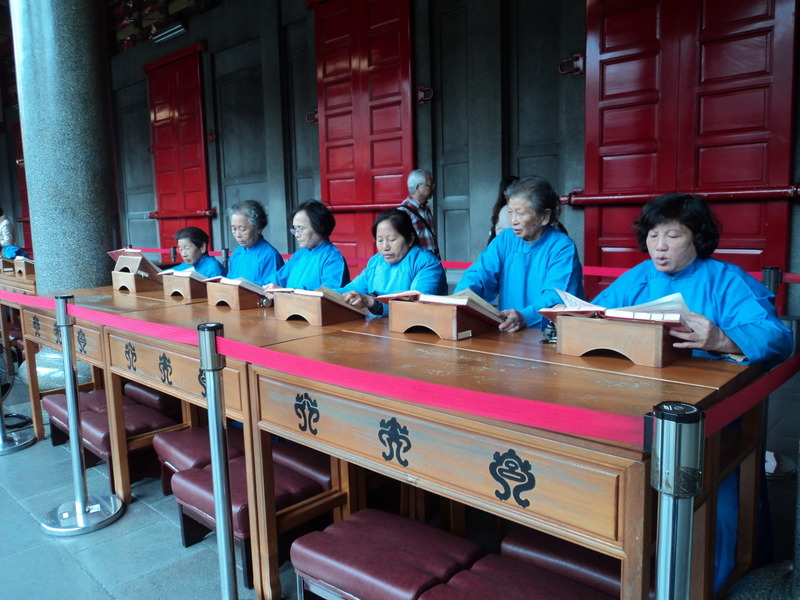 The elderly women that I saw praying was quite a revelation. I have always associated Asian temples as predominantly occupied by monks. I am not exactly sure who these women are, but from that red barricade, I knew that I wasn’t really supposed to approach them. 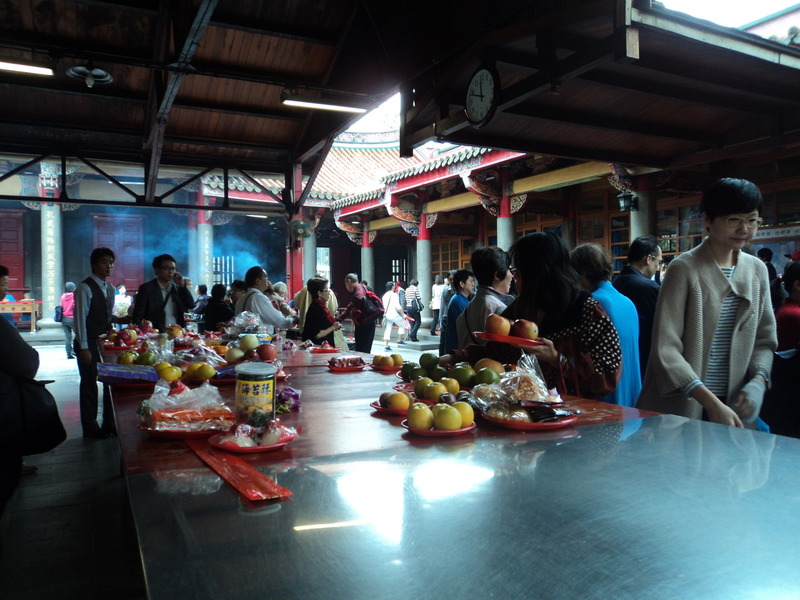 After lighting our incense and making wishes, you can once again be fascinated at the food offerings for the temple. Most of these offerings are pre-packed and sold right outside the temple. I am no expert, but I think certain types of food are for certain intentions and wishes. 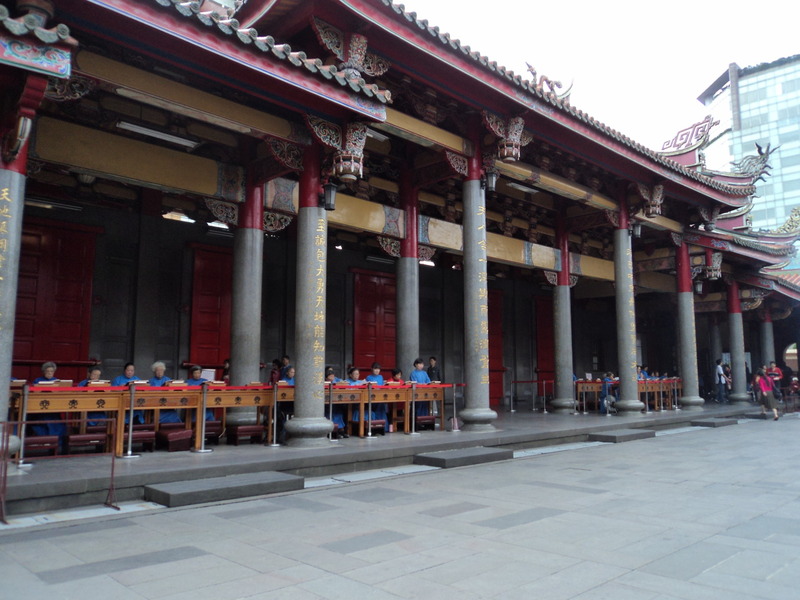 The Xintian Temple is not as grand as the Longshan Temple, but it is less noisy as well. It is crowded, but looking closely, I felt that the crowd were locals. This is a Sunday, so perhaps this is a temple day. This reminds me to research on countries I would visit next. I barely read on Taipei, thinking solely on my first conference. But at least I saw everything with a fresh eye and a scared and fascinated attitude. Today we visited one of the oldest temples in Taipei dating back to 1738. It was rebuilt after World War II, this Buddhist temple is devoted to the teachings of Bodhisattva Guanyin. I found it interesting that it had been modernized by the electric sign! Upon entering the courtyard you are treated to a waterfall (artificial ) on the left and a dragon fountain on the right. Two amazing bronze dragon pillars mark the entrance to the front hall and once inside it is very busy! Similar to the Tsoist temple yesterday, worshipers were offering food and burning candles and incense. We were treated to a service where the monks chanted and sang and the gong/bell sounded. The back hall has many other shrines to other deities. 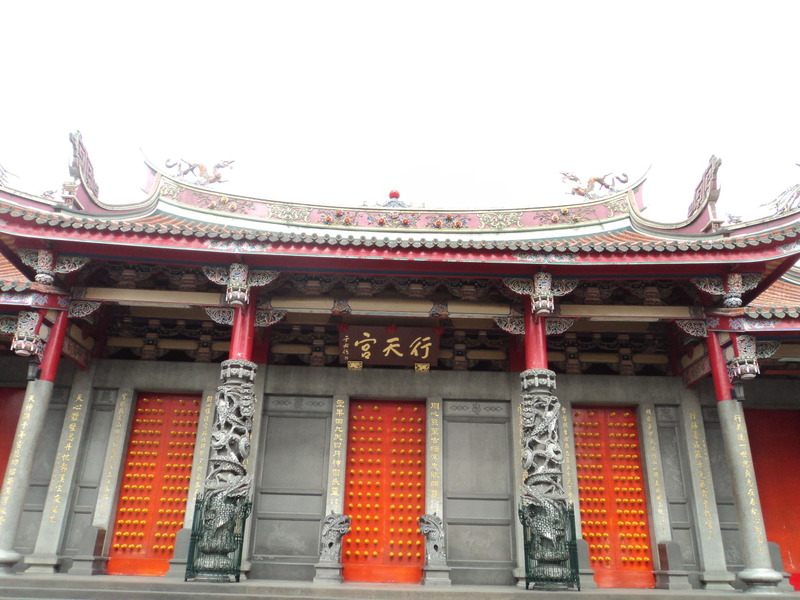 This entry was posted on January 22, 2013 by Portia Placino in Travel Writing and tagged architecture, Arts, Taipei, Temple, Travel, Xintian Temple.